Here’s some progress on my 1/12 scale 60’s era 57 Chevy Coupe Gasser being built from a Monogram kit. Seat is from a Corvette kit, the seat frame is scratchbuilt. Here’s an update of my 1/12 scale Monogram 57 Belair Gasser build. I’ve primed the undercarriage with red oxide Plastikote, and thin top coated with semi-gloss black paint. I then lightly rubbed edges with fine steel wool to age. Faux bolt heads and nuts are sliced styrene hex rod. When glue is cured I’ll finish sanding those and prime and paint them. 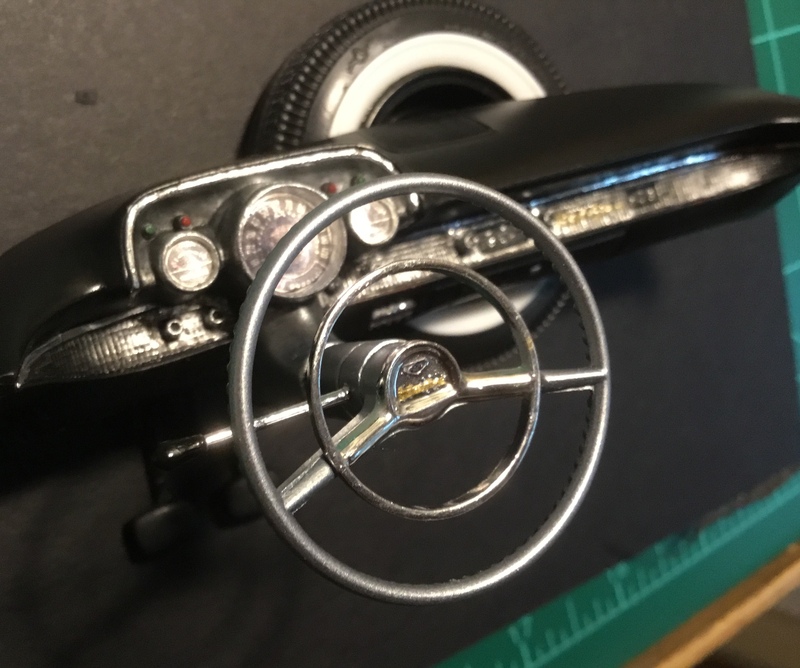 Here’s the progress on my 1/12 scale 1957 Chevy model car interior. The first photo shows the bare metal foil panel and the LED lighted instrument cluster. Second photo shows added aging detail. Didn’t take pics of the guage cluster construction, but is is made of different size lucite rods cut to 1/2 inches long glued to a roughly 1/2 inch By 1 1/2 inch by 1/16 inch lucite panel, which functions as a backlight. Micro LEDs are attached to the left and right edges of the lucite panel and then the entire backlight panel is wrapped in foil tape to reflect and prevent ambient bleed through light into the car interior. I then pressed that assembly into the hollowed out guage cavities. The guage graphics are vector art printed on decal material. I couldn’t get the art to print opaque, so the entire guage face and cavity lights up instead of just the type. Not realistic, but still cool looking. I sealed the decals with clear gloss acrylic to get a glassy look. Bench Seats are All Right With Me. This took some doing. My stock Monogram 1/12 scale 57 Chevy plastic model kit came with the option of solid molded bench or bucket seats. I was going to go with the buckets, but thought, What about modifying the bench seat to actually operate like the real car? Remember having to fold the seat forward to get into the back seat of a two-door? Well, after many hours of cutting, gluing, and trying different ways to hinge the seat backs so the outer edge of the seat back folds farther forward than the inner edge, I finally made it work, however imperfectly. The hinge arms are nylon model airplane micro pivot hinges and flattened brass tubing. the ribbed nylon hinge plugs into piece of styrene tubing glued to the seat frame. The inner part of the seat backs pivot on a small bolt and nut thread loosely through a styrene bracket glued to the underside of the bench seat. Everything can be disassembled for putty and painting. Here are some more shots of bodywork detail on my 1/12 scale 57 Chevy: trunk structure, hinge construction, and filler to try an simulate the smoother lines of real door jams.